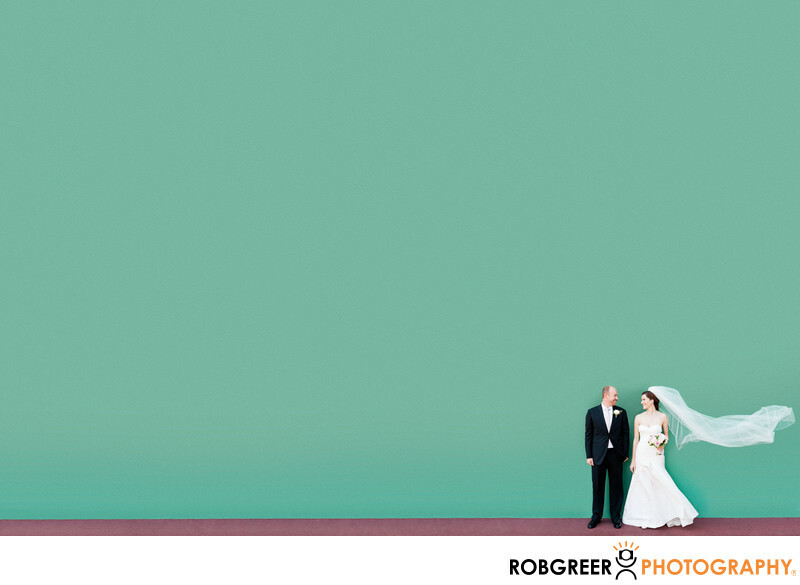 This whimsical image from Santa Anita Park race track is one of my most recognized wedding photos. If you're looking for an experienced event photographer or a wedding photographer familiar with this world-famous Arcadia venue, I hope that you'll consider me. Santa Anita Park is a thoroughbred racetrack that opened in 1934 and was designed in an art deco style. It is often cited as being one of the world's most beautiful racetracks. The green wall behind the couple in this photo is the signature color present everywhere at this incredible venue. This wedding moment from an incredibly hot August day represents a simple, clean, and natural moment between a bride and groom that's typical of my regular work as a wedding photographer. On this couple's special day, as we walked through various areas of this wedding venue, I remember looking for just a bit of open shade. It was terribly hot and I wanted to make sure that the bride and groom were kept cool and comfortable. However, at 4:00 p.m. on a summer afternoon, there's very little shade available at this location. I eventually discovered a small sliver of shade about 18 inches deep along a simple green wall. Taking advantage of this most basic location, I asked the couple to stand against the wall and look at each other. I most likely then said something funny in the hopes of evoking a smile and then, just at that moment, a sudden gust of wind blew the bride's veil into the air and I made this photograph. As you're reading this, you might not think much of a veil blowing naturally in the wind. However, in all of my years as a wedding photographer, I've never encountered a repetition of the perfection seen in this wind-blown veil. At most weddings, if a flying veil photograph is important to a bride, then I typically ask a bridesmaid or groomsman to throw the veil into the air to simulate this effect because waiting for the wind is typically futile. Ironically, just seconds after this photograph was taken, the wind picked up and the veil was blown free from the bride's head! It quickly rose into the air and eventually became stuck high on the stucco wall behind them. I was admittedly worried at this turn of events, but working together it only took a minute for me and the groom to retrieve the veil using a long broom handle we found nearby. Location: 285 W Huntington Dr, Arcadia, CA 91007. 1/200; f/5.6; ISO 400; 44.0 mm.